We have written previously about the US Embassy Beijing's air monitor in China's capital city (see U.S Embassy Beijing’s Air Monitor Tracks the Particulates in Your Lungs | March 22, 2010). The embassy does emphasized that "This monitor is a resource for the health of the Mission community. Citywide analysis cannot be done, however, on data from a lone machine." Now, Beijing's bad air is in the news again. 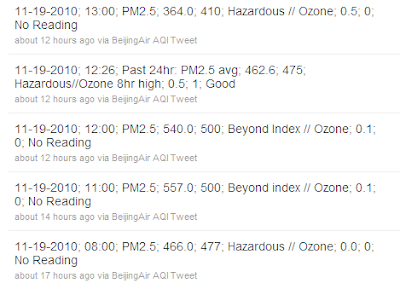 When it went off the charts yesterday, the US Embassy folks ran out of "conventional adjectives" and went for "crazy bad" -- later deleted, of course, and replaced with the more sober and boring term "beyond index:"
Since the US embassy in Beijing began tweeting hourly pollution reports last year, I – along with many other smog watchers – have been horrified at the frequency of "bad" and "hazardous" readings. But this week, the depth and murkiness of the haze was so appalling that the automated system briefly entered the realm of black comedy with a "crazy bad" analysis of our air. The outlandish description appeared on the @beijingair Twitter account late yesterday when levels of PM2.5 tiny particulate matter surged past 500, about 20 times higher than the guideline issued by the World Health Organisation. The "crazy bad" terminology – which was at odds with the normally sober and scientific language of the Twitter account – appeared to have been a joke embedded in the embassy's monitoring program and triggered by a reading that was off the normal scale. US officials quickly deleted "crazy bad" and replaced it with the term "beyond index", but not before the original message was widely retweeted by shocked Beijingers. One of my colleagues has taken to wearing a facemask on his commute through the streets. The Guardian's research assistant, Cui Zheng, prefers not to think about the air we all have to breathe. 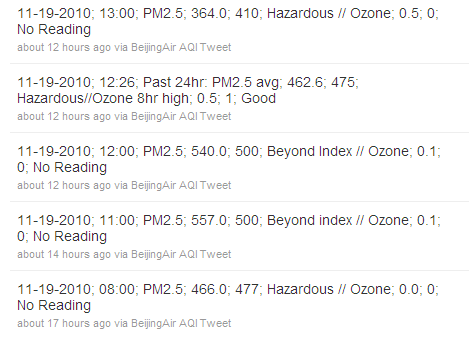 "I had to stop following the @Beijingair tweets. They were too depressing," she explained. [...]As I write, the air quality reading has improved to a mere "hazardous" but with the world outside grey and the lungs aching inside, "crazy bad" still feels entirely appropriate. On a side note, Beijing became a 15% hardship differential post for the State Department in January this year. An allowance -- "established for any place when, and only when, the place involves extraordinarily difficult living conditions, excessive physical hardship, or notably unhealthful conditions affecting the majority of employees officially stationed or detailed at that place." At 15%, Beijing and Shanghai have the lowest post differential among the US posts in China. The highest is 30% for Nanjing, Shenyang, Wuhan and Others, then 25% for Guangzhou and 20% for Chengdu. Makes one wonder what is worse than the crazy bad particulates in your lungs. When I was in Vladivostok in 2002, we were quite often the beneficiaries of China's air pollution. In addition, during the spring, Mongolian storms would put so much dust in the air that the sky would turn yellow and then blue-violet, with the sun appearing as light blue in the haze. The region was filled with a choking smoky smell, and local residents were told to stay indoors. That April, Vladivostok was hit by a freak snowstorm that, because of all the pollution, was actually pink in color. I suppose that's why we got the fifteen percent differential. By the way, Chinese air pollution is now so bad that some of it is making it all the way across the Pacific to California. So, China is exporting more to us than just poorly-made consumer goods.